Today was a fairly easy half day. 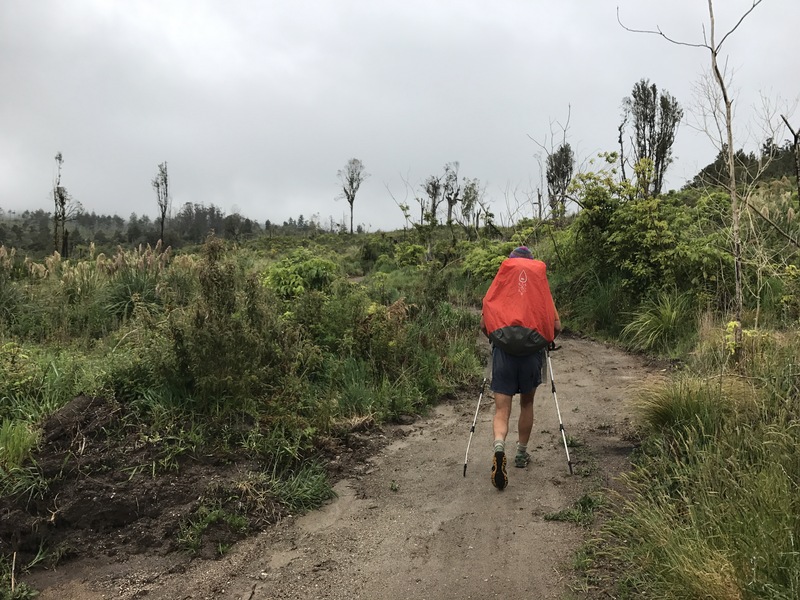 After nearly 10 hours of sleep, we woke up at 6:00 AM to make our way up to the Mount Pureora summit via the Timber Trail Cycleway. Maintained for mountain biking, the trail was super easy walking and we were crushing the km’s. The trail took us through some amazing forest reminiscent of early scenes from Lord of the Rings. 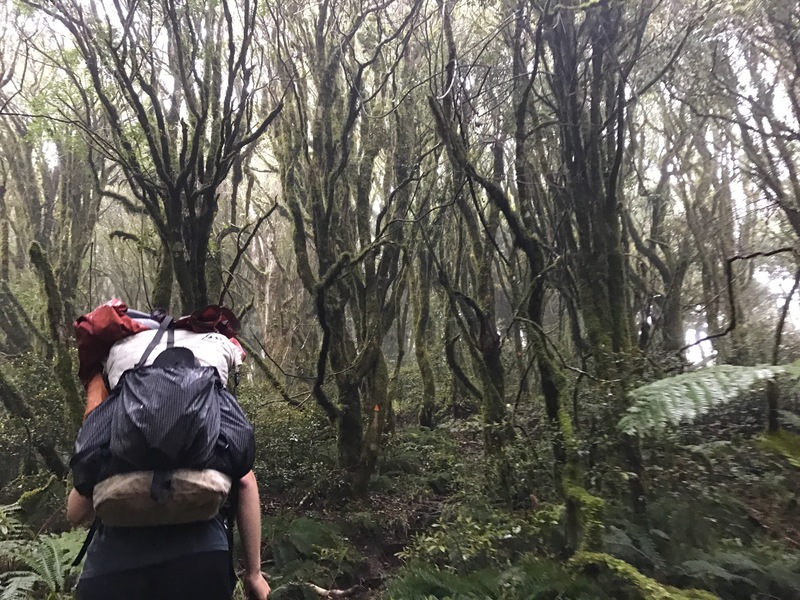 The scraggly moss-covered Hall’s Totoro trees steeped thoroughly in a night’s worth of mist set the tone for an ominous and beautiful stroll through the woods. Plaques installed by the department of conservation taught us about sections of the forest undergoing their third period of regrowth — the first and second having followed devastating volcano eruptions 18,000 and 2,000 years ago — after haphazard logging operations got out of hand a half century ago. 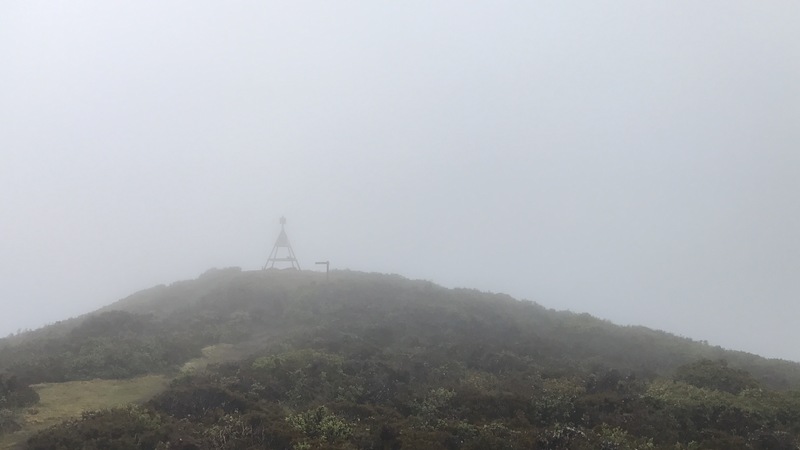 After 10 km we cut off Timber Trail to reach the summit of Mount Pureora. The short steep trail up to the summit took us about 20 minutes, and we only stayed at the summit for a few minutes to put on some more layers and head down and out of the ripping wind. 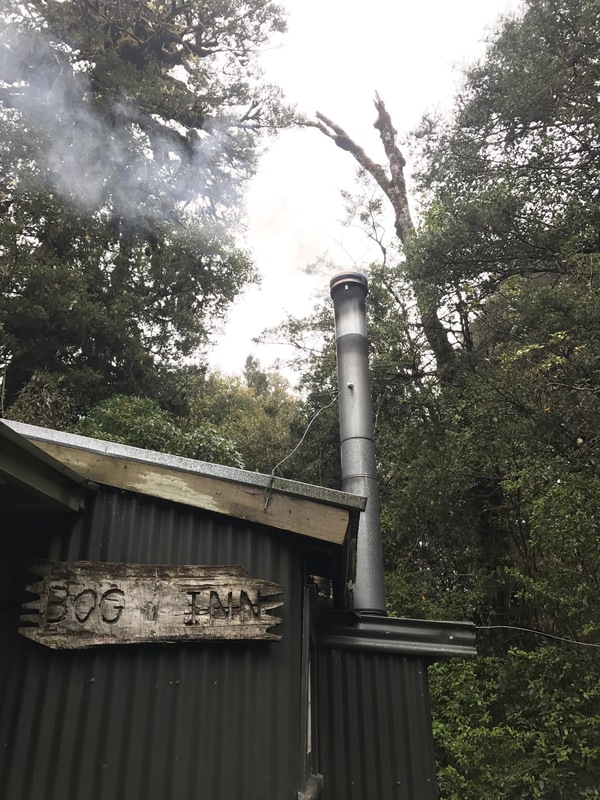 From there it was only 5 km until the charming and cozy Bog Inn hut (built as a forest research hut in 1960), where we were planning to either eat an early lunch and push on to Waihaha or camp for the day/night. We reached Bog Inn and reevaluated the trail notes, deciding the notes really did indicate 8 hours to the next hut (edit: this turns out not to be true at all, more like 3.5 hours). We decided to break open lunch and take out the sleeping bags. After a full afternoon of napping, reading, and Gin Rummy, we had a spaghetti dinner to top off the night. As we were wrapping up dinner, a big group of TA walkers (Doug, Eleri, Anna, Robert, and Kevin from Podge’s) arrived at the hut, excited to have finally caught the “four American” group. Apparently they’ve been chasing us since James’ place in Nikau Bay after Ngunguru, but were stuck behind us in part due to our big hitch from Mercer to Huntly, and yesterday’s hitch to the Pureora Base. Getting to know 5 new people has been great, made easier by the close quarters in which we’re living tonight. 9 people to a 4-person hut! Looks like most of us will be heading to Waihaha tomorrow. The new friends seem quite fast (40+ km today) so we’ll see how long we end up walking together. Nice to meet new people, excited to keep rippin tomorrow with Tongariro and Whanganui in the not so distant future. Great day.